Beta Marine BD1005, 28hp, installed in 2002. Comprising Beta marinised Kubota engine, with circulating freshwater/antifreeze, cooled by seawater via heat exchanger. Morse control to gearbox replaced 2016. 32mm diameter prop shaft in cutlass bearing in P bracket. Alternator output monitored by voltmeter in nav station. Standing rigging re in 2009. Foresails can be used as furling, (No2), or as luff groove hoisted, (No 1, 3, 4). Triple layer mahogany, (horizontal over double diagonal), on laminated mahogany frames on strong heavy stainless steel framework. Lead keel supported by 8 No 33mm diameter stainless steel bolts, replaced in 2009, bolted through stainless steel frame and into anchorage galleries in the keel. Rudder of mahogany on stainless steel frame, supported by skeg. Teak laid decks on plywood. (Recent yacht condition survey recorded wear to the teak planking). 2 stainless steel water tanks below saloon berths. 7 separate berths, arranged as 2 berths in fore cabin, 4 berths in salon, (including 2 generous pilot berths), and one berth further to the stern alongside navigation station. Numerous storage lockers + 3 hanging lockers. Galley with 2 burner cooker with grill and oven. Stainless steel sink. Insulated coobox. Storage lockers. Heads with Jabsco WC and stainless steel sink. Storage lockers. Secure and spacious navigation area with chart table. Nav seat withdrawers and cabinet for tools. Zeus 7 GPS Chartplotter with UK and northern Europe charts, installed 2014. Simrad AIS, self contained, transmits and receives position. Autohelm ST 50 instruments, 4 No, comprising: Wind, Close hauled VMG, speed log, depth. The ST50 instruments are interfaced with the Zeus 7 chartplotter GPS, providing it with a full range of functions including tide strength calculation etc. 2 further repeaters in cockpit for GPS position and other functions. Compass heading displayed electronically in cockpit. 2 conventional compasses viewed from cockpit. 6 person Seago offshore liferaft, requires service. 406 EPIRB, requires new battery. 2 fire extinguishers, in saloon and galley, + a third in engine bay. Totally stunning yacht suitable for cruising or racing, Widely admired. I loved the size of the cockpit and very smart interior. Same owner for last 23 years. The condition of the wood appeared to me to be outstanding, however a recent yacht condition survey recorded wear to the teak planking. Owner tells me this yacht was a survivor of the stormy 1979 Fastnet Race. The author of the book Fastnet 79, (Len Gardner), was sailing on this yacht during the race. Classic 1970’s Cruiser Racer, varnished mahogany topsides, lead fin keel, rudder on skeg, 7 berths, roller reefing No2 jib + 10 further racing sails. Twin spinnaker poles. Beta Marine 28 hp engine, installed 2002. Folding propeller. Stainless steel fuel tank. Hull is triple layer mahogany, (horizontal over double diagonal), on laminated frames, built on very strong stainless steel frame. 7.6 tonnes. Built by Clare Lallow of Cowes in 1974. Teak laid decks. 30 gallon water capacity in 2 stainless steel tanks. Lemar winches. 6 man liferaft. 35lb CQR anchor + lighter kedging anchor. Emergency tiller. Danbuoy. Mooring warps and fenders. Twin sets of spinnaker sheets, guys and pole downhauls. 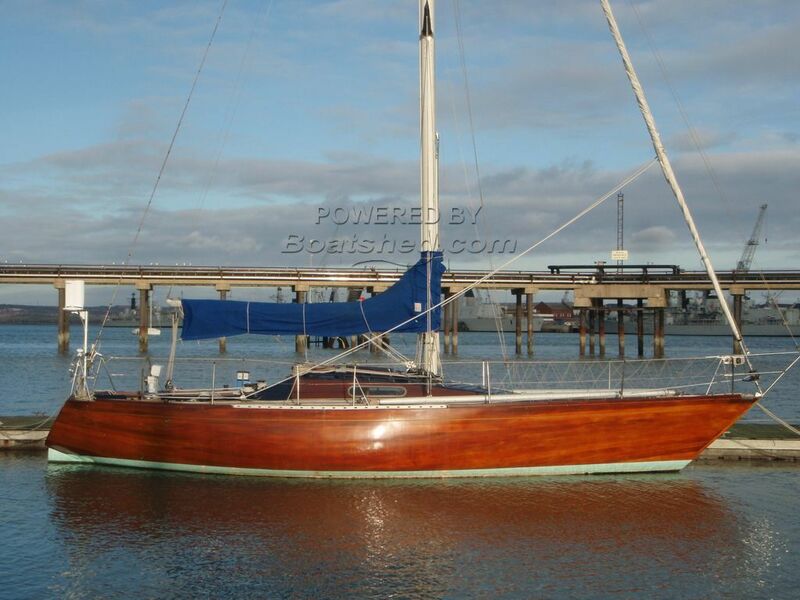 This Carter 36 One Off has been personally photographed and viewed by Samantha Cassell of Boatshed Portsmouth. Click here for contact details.